Grade Looks Wrong - What Happened? Weighted grading, an optional feature in HSTOnline, allows you to assign greater value to certain assignments within the same Course. You can opt to use Weighted Grading in one Course, all your Course, some of them, or none of them. Weighted Grading is not for everyone and you'll have to decide it if is a necessity for each of your Students. Without weighted grading, all assignments have an equal effect on the overall grade. 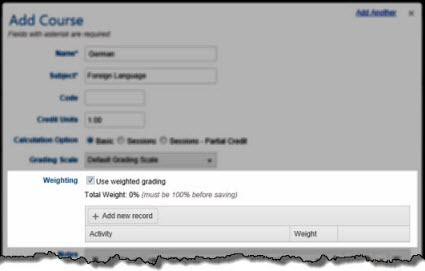 With weighted grading, you assign a value - or weight - to Activities within a Course. The weights you set can be any value you like, as long as the total weight for all Activities within a single Course equal 100%. The assigned weight is multiplied against the grades within the Activity, and finally the weighted grades for each Activity are added together to get the final Term grade for the Course. Because HSTOnline allows you to grade just the items you choose to, you may find that Weighted Grading is not necessary in your homeschool. If you decide to use the Weighted Grading feature, you must insure that there is at least one completed, graded Assignment for each weighted Activity within the Course in each Term of the school year or the student's overall grade will be adversely affected by the missing percentage(s). When Weighted Grading is in use, the Grading Overview area is especially helpful as it will show how the weighting is affecting your student's grade for each term. How much should I weight each activity? It depends on what is important to you, the Course, your curriculum, your umbrella school if you report to one, and, possibly, your student's strengths and weaknesses. Generally, the larger a portion of the course work the activity covers, the higher the weight assigned. So research papers are more than journal entries, test more than quizzes, etc. The only unbreakable rule is that the total of all weights within a course need to equal exactly 100%. The Activity field must be enabled in the Optional Fields section of the Program Options menu. You must have at least one non-archived Activity on your Activities list. In the Courses Help Page, there are directions for adding weighting when creating a new Course. The directions below explain how to edit a Course to add weighted grading. On the HSTOnline menu, click or touch Courses. On the Courses page, double-click on the item you want to change to open the Edit Course window. Alternatively, you can click once on the item you want to change and then click the Action button and choose Edit to open the Edit Course window. On a touch device, touch the item you wish to edit and then touch the Action button and touch Edit to open the Edit Course window. Click or touch the 'Add new record' button. A new line will be added to the Weighting table. Choose an Activity from the drop down list. Scroll through the list and click or touch the Activity you want to use. Or you can type a letter in the selection box to move to that area of the list. Enter a weight for that activity, anything from 1 to 100. Repeat the above steps until all weighted activities have been added and the total weighting equals 100%. To change an entry you have already made, click or touch the Activity to select a different Activity from the list; click or touch the weight to change that value. To remove an entry you have already made, click or touch the Delete button for that line entry. Make whatever other changes are needed for the Course. Cancel to abandon the changes and close the Edit Course window. Save to commit the changes to your Subject and close the Edit Course window. Click or touch the Previous or Next hyperlink in the top right corner to save your changes to this Course and move to the previous or next Course in the list. You can click or touch Previous or Next until you have made all the changes you want to your Courses and then click the Save button to end the Edit process. If you reach the beginning or end of the list when clicking or touching Previous or Next, the Edit window will close and you will be returned to the list view. To see how Weighted Grading can make a difference in your student's overall grade, we will take the examples given for Averages and Sum Earned/Possible from the Grades Help Page and add the weighting component. For this example our Algebra Course will have a weighted Activity of 'Test' with a weight of 70% and a weighted Activity of 'Homework' with a weight of 30%. To jump right to the Sum Earned/Possible examples, click here. 83% for whole number rounding. 81% for whole number rounding. so in this instance, weighting the activities caused a decrease in the Student's overall grade for the year by 5-6 points. The most significant difference in weighted vs. non-weighted grades will appear when there are a large number of assignments in a particular activity, as well as more graded assignments overall. Continue reading to see the effect of weighted grading on our previous example using the Sum of Earned/Possible option. 84% for whole number rounding. so in this particular instance, the weighting actually helped the student's overall grade. The most significant difference in weighted vs. non-weighted grades will appear when there are a large number of assignments in a particular activity, as well as more graded assignments overall. The Report Card/Transcript Grade Looks Wrong - What Happened? At any time, you can remove Weighted Grading for a Course by editing the Course and removing the checkmark for the 'Use weighted grading' option. HSTOnline will remember your weightings so you can turn that feature back on if you change your mind again. If you have found that you are not going to be using the "missing" activity at all for the Course, simply edit the Course to delete the activity and redistribute the weighting. You can also change the weighting for that activity to zero, rather than removing it. Remember: Changes you make to the weighting of a Course will affect all assignments attributed to that Course - past, present and future. If you need the activity for future terms or for other students taking the Course, you can add one completed assignment for that activity within the affected Term, with a points possible value of 1 and a points earned value of 1. This will also skew the grade slightly, but in the student's favor, giving the activity its full weight in the overall calculation of the grade for the Course.